OPINION: After decades, a writing teacher returns to deer hunting and reflects on its future | Back Page | Style Weekly - Richmond, VA local news, arts, and events. Just after Thanksgiving, once you venture off the banal corridors of the interstates, you'll find men, as well as a few women, wearing blaze orange and camo in various hues. They lean casually on pickup trucks or SUVs with actual mud on them. Like me, they have come to cull an exploding population of white-tailed deer. In 2017, I rediscovered an essential truth: If you want to kill a deer, you must embrace the joy of sitting still for hours. For the first time in 30 years, I walked into the forest with a rifle and without smartphone reception. Clearly I am not alone in my rediscovered hobby, but I did not imagine that I might be among the last generation of hunters. I started hunting while in grad school at Indiana University, not after reading too much Ernest Hemingway but after a vegetarian colleague lectured me. If I were to continue to claim any moral high ground while eating meat, he claimed, I actually had to kill something other than pitchers of cheap beer. He was right: How many of us care to imagine the relentless but mostly hidden cruelty that industrial farming causes to cows, pigs and chickens? Wild game seemed different. Once I found an older hunter to mentor me, it proved easy enough to discover that I did have it in me to shoot an animal and fill the freezer. When I finished grad school, however, I left my hunting buddy and hobby behind. Then, at a Buckingham County neighbor's invitation, I went back to the woods to hunt. It was a strange experience for an academic who practices yoga, that willingness to snuff out the life of something graceful and more woods-wise than I'll ever be, but there you have it. I like the taste of venison. So do most of the hunters I meet, though for many new to the hobby a lot of other things are in play. I was not prepared for the cultural changes that have come to deer hunting. If the absolute number of hunters has declined nationally, the industry supporting them has exploded faster than a hot round of .30-06. I strongly recommend the odd, touristic experience of visiting Cabelas or Greentop near the start of the season. You will see pickups looming 8 feet off the pavement, with stickers featuring the silhouette of an AR-15 and the words "Assault Life" under the gun. Couples in perfectly matching tree-bark camo descend from these immaculate behemoths to enter the store and spend thousands of dollars not just on guns, but on tree stands, tent blinds, scent-block sprays, food to feed the deer off-season and lure them once the guns thud again, smokers and vacuum-sealing machines to prepare and store the venison. Like Elmer Fudd dropped suddenly in the midst of Seal Team Six, I simply did not know what to make of all this. If you carry a Winchester made the year you were born, what can you say about $2,000 rifles sprayed in camo, topped by $1,000 optics? Game cameras with motion sensors and flash-memory cards? Ten-thousand-dollar ATVs? Suddenly my quiet, solitary, low-tech hunting seemed more akin to chasing down a mastodon in the Pleistocene. The most tool-intensive part of my pursuit involves reloading bullets, mostly because I'm a cheapskate. When I was in grad school, some hunters I knew had shotguns that their fathers had bought right after World War II. We mostly set up on private property, or hunted by lottery the national forests where I and my old Mossberg were checked to be sure that I carried no more than five shells. I had to walk in a couple of miles and if I got a deer, my partner and I would have to drag it out. What I see now in the sporting-goods stores? It makes me a little sick, like all the consumerism that is consuming our planet. This commoditization of the hobby may not, however, save hunting. Those representing animal rights may cheer the national decline in hunting licenses issued, from more than 40 million in 1970 to just over 10 million today. Yet hunters remain the apex predator for white-tailed deer, a species reintroduced to Virginia in the mid-20th century to prop up a failing native herd. We know the rest: The population exploded, and according to sources not from any hunting group, without a 40 percent culling annually, deer can devastate our already troubled forest ecosystems. I've some hope that coyotes moving into every corner of the state will do their part, as well as attempts to reintroduce bow hunting to suburban areas with large herds of deer, but those won't be enough if the new generation of lavishly equipped hunters is our last. 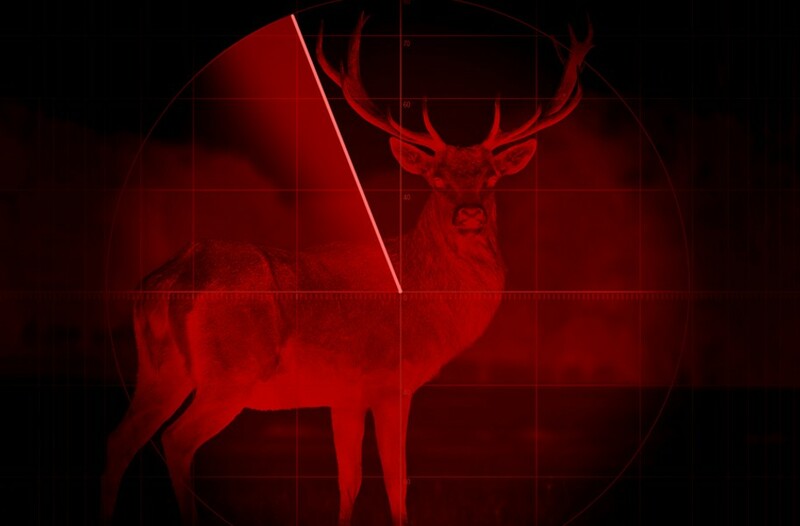 Right now, hunters and drivers are doing the culling. At the end of my last hunt, I pulled into my driveway after seeing two dead animals just down the road: a doe and a coyote. The future of hunting is beyond my control, but I think my rifle and I have found the right place and partners for doing it the way I prefer. In my corner of Buckingham County there are many African-American hunters of the old-school sort, gathering at "the Turnout" to lament a day's bad luck or brag about the occasional score. They don't have $2,000 guns or $50,000 rides. Like me they wear a mishmash of army surplus and orange, and they don't mind a city-bred white guy who owns land there hanging out, especially when he occasionally lets one of the neighbors come on the land to reclaim a dog or, just maybe, bag a deer to feed their families.